Telescope C-11 optical tube f/10 or 6 inch f/12 AP "Super Planetary" Refractor (with two internal flats to provide short tube length). Scope fitted with RoboFocus for remote control focus, video viewfinder, etc. Includes Celestron f6.3 reducer, Optec x3 reducer, x1.8 Barlow, x3 Barlow. SBIG DSS7 Spectrometer, with usual imager being an SBIG 402 camera. Telescope control using TheSky, as well as home brew tracking and DSS7 control software. Imaging controlled by Maxim, analysis using Maxim and Excel. Note: All images are compressed JPEG files, file size under 100k except where noted. M82 taken 1/21/2000. 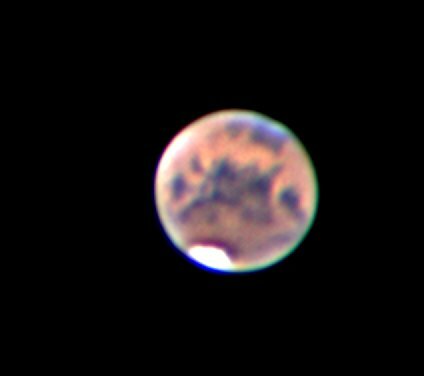 f12 4600 seconds, MaxEnt and DDP processed. 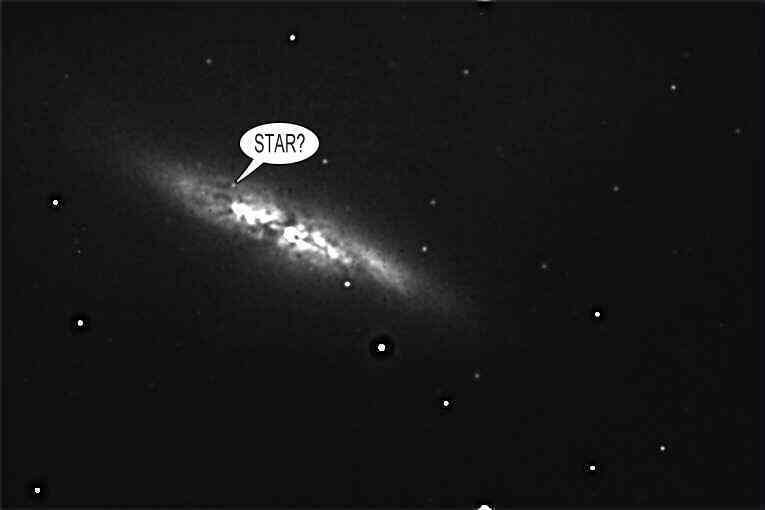 Shows apparent star/supernova?. 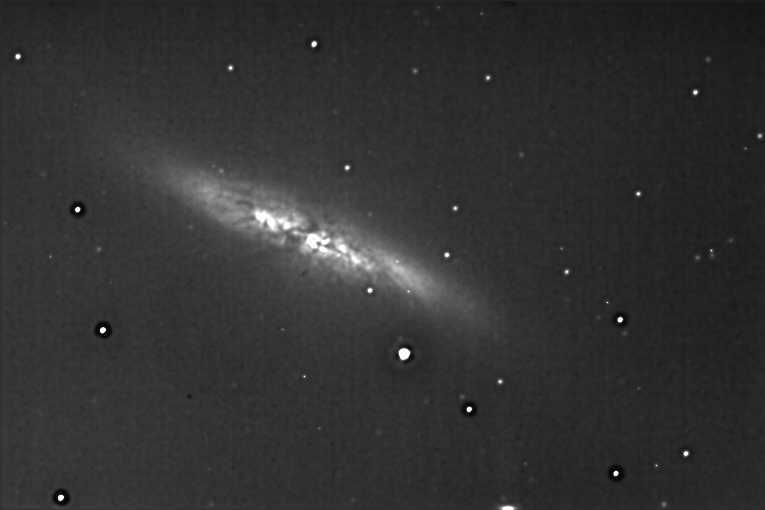 M82 taken 1/7/2001 f12 13x10min, MaxEnt and DDP processed. Star/supernova missing. 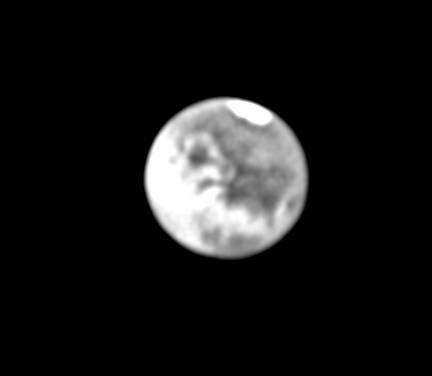 Mare Nectaris area. 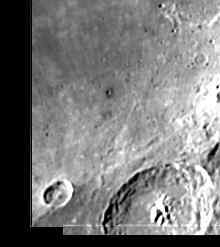 This shows the many small craters in the area. See if you can spot the DHCs mentioned below. 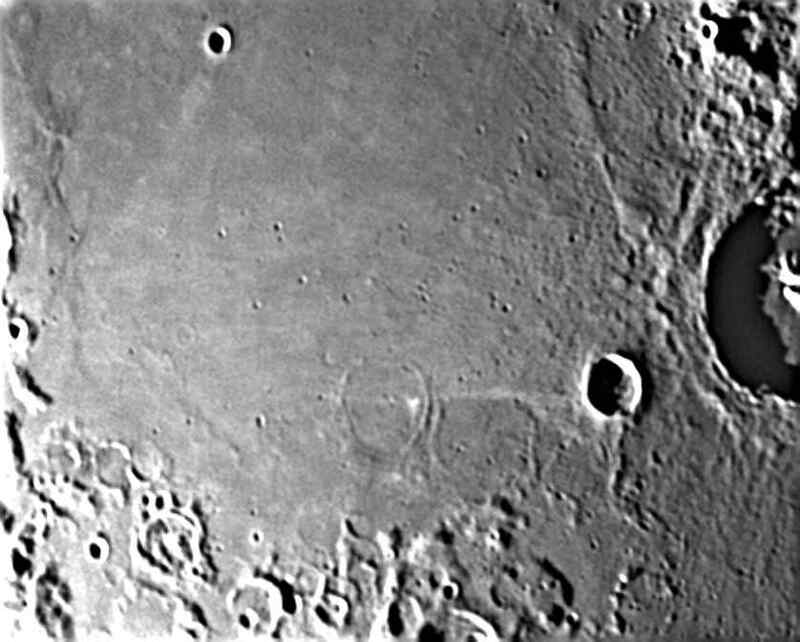 Dark Haloed Lunar Craters (DHC). The moon has several dozen small craters that are surrounded by darker material. Not much is known about the cause of the dark material; however, volcanic emission seems to be one of the leading theories. After stumbling onto a pair of these in Mare Nectaris, I have been studying the contrast under different lighting conditions to gain some additional insight. The relatively poor seeing in our mid-Atlantic area, and the small refractor, make this study at the edge of feasibility. Here is a picture of the area, somewhat enhanced. Theopholis (75 km dia) is the large crater at the bottom of the picture. The upper DHC is about 3 miles in diameter, the lower one is about half that, and not easy to see under this lighting. 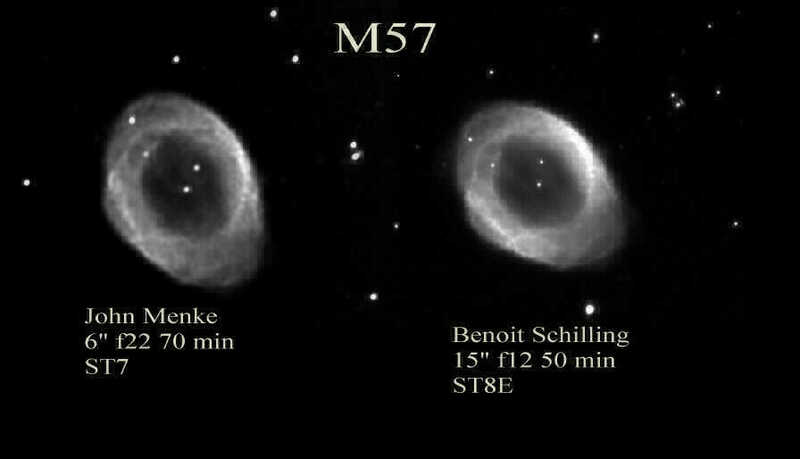 M57. Stimulated by the excellent picture on the right by a well known astrophotographer, I took the picture on the left with my 6 inch. Clearly the right hand picture is better, but the left hand shows that with effort you can still do good work with a small scope. Exposure was about 2 hours. 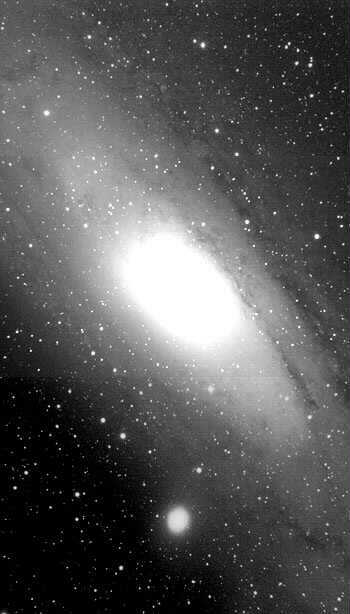 M31, The Great Galaxy in Andromeda. This is a group of three exposures with 20 min. exposures at f4. The mosaic was put together using MaximDL (first attempt). With heavier processing, one can bring out more of the central region, if desired. Comet 2002 (Ikeya-Zha). UL Comet on June 9, 2000 shows some faint anti-tail to the right. To show the tails more clearly, I averaged 16 comet images each rotated 22.5 deg, then subtracted from the original giving UR image. On Jun 21, in strong moonlight, I took 30x1 min exp, median combined. The comet has about half its former brightness. Background moonlight is about 9x the background of the June 9 image. Even so, with no processing, one sees a much sharper and relatively brighter anti-tail to the west (right, sunward) as we pass through the plane of the sun-comet-earth. In the one minute exposures, the anti-tail is about 10 counts out of about 2000 background, the comet nucleus is about 500 counts above background. Note: Unless noted, all studies are PDF files, which can be downloaded and viewed with Adobe Acrobat Reader. If you do not have the free Acrobat software, click here to download. EY Ceph "A Neophyte's Determination of EY Ceph Curves and Orbital Constants" (PDF file, 185K). This paper was presented in May, 2002 to a meeting of the International Amateur-Professional Photoelectric Photometry-Western Wing (IAPPP) in Big Bear, California. It describes intitial measurements of the EY Cephius eclipsing binary system. Flats "Are Flats Really Flat?" I discovered a characteristic of the ST7E camera in which internal reflections in the camera can create a 2% gradient in the flat. Use of the flat for calibration can then introduce an error when performing high precision photomertic analysis. We show that a simple mask can prevent this effect. C11 Mirror Flop "C11 Upgrade"
Although the optics of the C11 were excellent, I was experiencing image shift as the scope moved to different positions. I modified the mirror cell of the scope to reduce mirror flop. This paper describes the results. Spectrum taken on July 2, 2005 using DSS7 Spectrometer. Very poor signal to noise, but the comet was faint: an interesting first try. See below for better results. "Just How Good are Flats?" 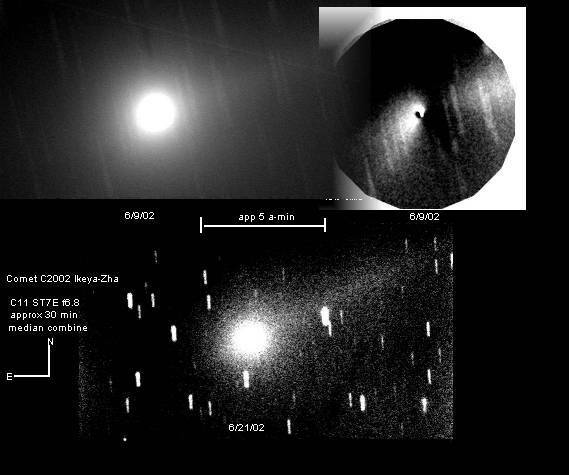 "StarZap: A Method of Removing Unwanted Stars"
StarZap is an automated program that can remove stars that interfere with the measurement of asteroid brightness. The program uses tools available in MaximDL. This PDF (with slight modifications) is the second half of the paper described above. The program and source code (VB6) are open source and available free. Click here to download the installation zip file, which includes an essential "READ ME" file. This paper describes my setup using a C11 and DSS7/402 combination to observe astronomical spectra. I also discuss briefly some of the challenges of the operations, as well as corrections needed to make the spectra useful. This paper gives some of my spectroscopic observations of various objects, including M57, and Comets C073 and Comet Swan. An analysis of the coma density, including models and measurements of transparency during the first eleven days after outburst. A new method of performing a drift scan to measure asteroid occultations. Demonstrating how some "huge errors" in a flat source can sometimes make no difference. Surpirse! This paper describes construction, testing and operation of an 18-inch f3.5 Newtonian telescope, brought into service in 2007. Construction of a remotely operated telescope cover (for the scope described above) and associated electronics. Can Global Warming be Stopped? This Power Point presentation outlines a very pessimistic (but realistic) view of our future ability to cope with global warming. This is a lay sermon that analyzes the Unitarian-Universalist 7th Principle (concerning the interconnected web of existence) from a very different point of view than is common. The sermon discusses global warming as a major example. This paper analyzes energy sources that could substitute for fossil fuel. The conclusion is that only nuclear electricity and conservation can meet the major needs of the world in the short (40year) time available. How effective are new, more sensitive video cameras for occultation measurements? This paper reports my findings when I compared four cameras in six tests. Results suggest that the increased sensitivity in some models is more usesful than in others. Spectrum of Comet Lulin, taken February 23, 2009, with comparison to Comet Swan spectrum.